Ajman was a Persian Gulf Sheikdom under British Protection from 1820 until the treaty expired in 1966. Ajman was part of what was called Trucial States, so named because of a truce signed between Great Britain and the Sheikdoms primarily aimed at stopping piracy, which was a huge threat to British Indian ships. The area has a total land area of just 100 square miles and a population of over 360,000. Population grew rapidly from a base of only around 6,000 in the 1960s. 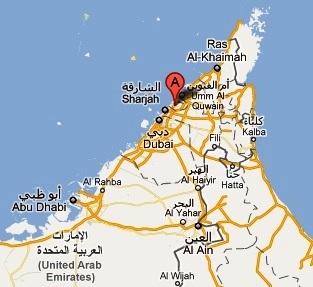 On December 2, 1971 Ajman became one of the six original members of the United Arab Emirates. Following the success of Dubai, Ajman was the second emirate to offer freehold property and it experienced a boom-and-bust cycle of huge proportion in the 2000s. Ajman issued a number of stamps during the period from 1964 to 1972. The first issue was a set of eighteen stamps released in 1964. The set (Scott #1 to #18) catalogs for around $10 MNH and around $8 for Used. The designs show a portrait of Rashid bin Humaid al Naimi along with Arab Stallion, Regal Angelfish, Camel, Angelfish, Green Turtle, Jewelfish, White Storks, Wite-eyed gulls, and Lanner falcon and is denominated from 1np to 10r (1 Rupee = 100 Naye Paise). A set of eight stamps in memory of John F. Kennedy along with a Souvenir sheet of the highest four denominations followed on December 15, 1964. That set (Scott #19 to #26) catalogs for around $8 MNH and around $5 Used. A couple of other issues from the 1964 to 1965 timeframe where issued before the Indian Rupee devaluation and subsequent adoption of Dirhams. The stamp issues of Ajman of the period from 1965 to 1972 were targeted primarily at the philatelic market and it includes overprints (new currency) on some of the first issues. Stamps of the Trucial States including Ajman earned a bad rapport among collectors as the area produced a large number of stamps and sold them at vast discounts to stamp dealers, thereby making the issues virtually worthless. Such issues include the April 20, 1967 Transportation Set of 9 stamps, the June 12 1967 50th Anniversary of the birth of President John F. Kennedy set of 9 stamps and a couple of miniature sheets, the July 10, 1967 Arab Paintings set of 6 stamps, the August 5, 1967 Arabian Tales set of 7 stamps, the September 1, 1967 Asian Paintings set of 5 stamps and a miniature sheet, the October 23 1967 World Boy Scout Jamboree set of three stamps and a miniature sheet, the November 15 1967 Summer Olympics in Mexico set of 4 stamps and a miniature sheet, the December 5, 1967 Winter Olympics set of 4 stamps and a miniature sheet, etc. A number of Airmail sets and Miniature Sheets in varied themes were also “produced” for sale to dealers during the period till 1972. The first coin of Ajman was a Silver Riyal issued in 1969. The coin (KM#1.1) catalogs for around $10 in BU. It had low mintage (20K) and was issued as a non-circulating legal tender coin. A proof version with very low mintage (1200) also exists and that catalogs in the $45 range. The design shows Value in Circle in Obverse and a National Arms design in Reverse. The Reverse design and certain variations are used in most of the issues till 1970. A number of Silver proofs with the common reverse design and Great Men portraits in Obverse were issued with Mintage of 1175 were issued and they generally catalog in the $75 range. A number of Essais and Patterns were also issued during the period till 1971.